Around the country events are underway once more for National Family History Month. 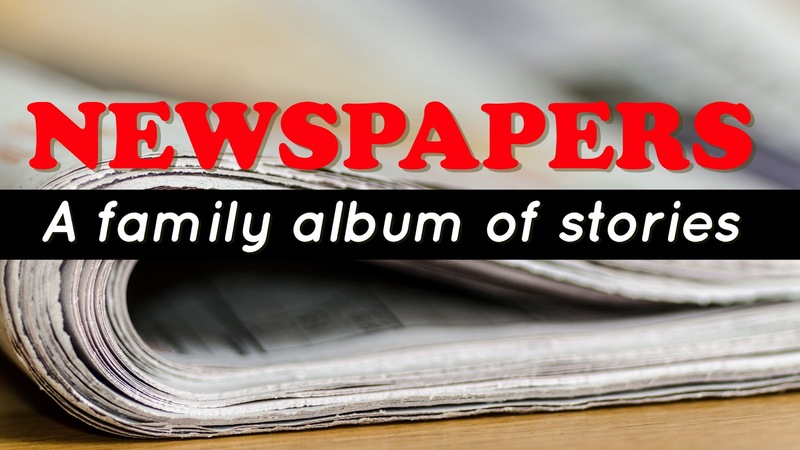 Noosa Library Service has four events to celebrate NFHM starting today with Newspapers: a family album of stories. A wealth of family related material is available through newspapers of the past and the rapid digitisation undertaken by organisations, libraries and other authorities provides unprecedented access online. Here's a limited list and some search tips for investigating those resources. Today's presentation is available to view from this link. In newspapers of the times one can expect to find family notices, obituaries, details of social occasions, sports teams, memberships of organisations and churches, advertisements, businesses, awards, letters, shipping news, real estate, wills and probate notices, scandal, criminal and divorce proceedings, accidents, photos and more. These pictures of everyday life and situations enrich our family history. At the top of my list is Trove the National Library of Australia's fabulous free compilation. Use the free login to keep track of your research. PapersPast provides an excellent starting point for New Zealand and related areas research. British Library newspapers - 17-18th Century Burney Collection Newspapers and British Library Newspapers (parts I - V). The time period covered by these combined collections is 1600-1950. The Telegraph Historical Archive 1855-2000 over 1 million pages of content and includes the Sunday edition from its inception in 1961. Shelley at Twigs of Yore has published a useful Trove helper. Kenneth Marks at Ancestor Hunter has written extensively and provided tutorials about searching newspapers. View a variety of channels to pick up the best tips from the experts. Learn what’s online, useful books to read, the benefits of joining genealogy and family history societies, and how to record and organise your research. Presented by Shauna Hicks. Noosaville 10-11am Tuesday 15 August. Free. Bookings required. Book here. Discover the treasures that family and local historians can find in court records including those created by the Supreme Court, Court of Petty Sessions, Licensing Court, Small Debts Court, Coroner’s Court, District Court, Circuit Court, Children’s Court. Presented by Judy Webster. Do you want to share the family stories you’ve found in researching your family tree? This presenatation will help with what to consider before you start developing a plan. Presented by Pauleen Cass. Noosaville 1-3pm Wednesday 30 August Free. Bookings required. Book here.